All That You Can't Leave Behind Album reviews. I'm impressed. Really impressed. 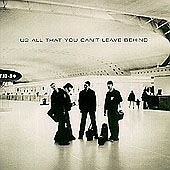 U2's new CD, All That You Can't Leave Behind, is one of the best "band" efforts in years. When I say band I don't mean Backstreet Boys or 98 Degrees boy bands. I mean bands that play real instruments and not the ones that pose like Barbie dolls. It's been a long wait for U2 to return to its music roots ( The Unforgettable Fire, The Joshua Tree ) and get the tech-pop thing that has influenced its recent CDs (Pop, Achtung Baby.) out of their system. However, U2 seems to have rediscovered it's the songwriting that matters and with this new release, the writing combined with various musical influences and arrangements, makes an effort to reassure its core fan foundation they can walk the fence and be the U2 of 10 years ago as well as the U2 of this decade. Although U2 is famous for their political-tinged song-anthems, All That You Can't Leave Behind is subdued with mini-anthems "New York," "When I Look at the World," and "Peace on Earth," that will strike individual chords. While "Elevation," and "Beautiful Day" will probably be the CD's most-played and talked about songs, my choice for best song on the album is "Grace" the final cut. I have yet to pinpoint why this song is sticking in my mind, but it is a beautiful U2 ballad. The cd's liner notes mentions the song is dedicated to Aung San Suu Kyi, a Myanmar opposition leader who is under arrest in Burma. Is this CD radio-friendly? I don't care, I rarely listen to radio now. But does it matter? No, because the music talents of Bono and The Edge can not be compared to the bubble-gum rap of Eminem and others who are topping the charts these days. "...Still I'm trying to figure out my mid life crisis/I hit an iceberg in my life/But you know I'll still afloat." You could say those lyrics sums up the band's recent musical adventures. Don't buy this CD expecting to hear The Joshua Tree - type songs. Expect to hear songs from a band that has matured. A band that has tried different musical experiments to expand what they could do as a band. All That You Can't Leave Behind succeeds because of their past efforts and it stands way ahead of anything on the charts today.